With their stylish shiny cases, gorgeous colours and sophisticated textures you’d never guess that the beautiful new Lily Lolo lipsticks come at such a miniature price. At just £8.99 these lovely lipsticks are less expensive than many high street brands yet contain none of the usual nasties such as petroleum based oils, parabens and synthetic fragrance. Instead their fragrance free formulation includes nourishing vitamin e, rich plant waxes and organic Jojoba oil. These are natural creamy lipsticks for beautiful and nourished lips. They apply beautifully with a smooth, even, cream application that just glides on. Each shade gives a stunning natural glow while protecting your lips with the natural antioxidant properties of Vitamin E and Rosemary extract. 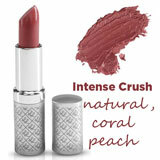 Intense Crush – A natural, coral peach. Demure – A natural, peachy beige. 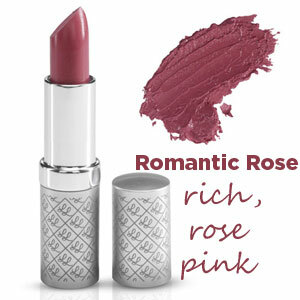 Romantic Rose - A rich, rose pink. Love Affair – A dusky, brown pink. French Flirt – A warm, mid-toned red. Desire - A cool, intense red. Since 2005 Lily Lolo has been leading the field in high performance affordably priced mineral make up. The long awaited lipsticks are a real delight and already attracting a lot of attention. We’ve got our fingers crossed that mascara will be next on the Lily Lolo agenda. If you fancy giving the new Lily Lolo lipstick a try all 6 gorgeous shades are available now with free delivery.